St. Catherine, JA/New York, NY (Ms. RAINE INC): Vybz Kartel is perhaps the most talked about man in Dancehall--a captivating figure noted just as much for his supposed rivalries and alleged personal controversy as he is for his suave but brazen delivery, racy content, and sharp lyrical agility. His latest album Pon Di Gaza, slated for release on iTunes on Tuesday, September 22nd, gives listeners a totally different perspective; an in-depth look at the man behind the myth. 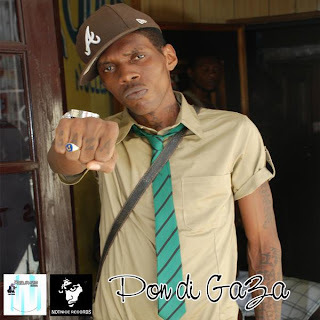 Released on the Adidjahiem Records/NotNice Records label, Pon Di Gaza is a complete portrayal of the life and times of Adidja 'Vybz Kartel' Palmer. Tunes like the Billboard-charting single "Ramping Shop" featuring Spice, "Virginity" featuring Indu, and "Like a Movie" give audiences the flashy Vybz, while new singles like "Teardrops," "What You Won't Do for Love," "Can't Frame Me," and "Yea Though I Walk" gives personal testament of the trials, tribulations, and triumphs of Adidja. "The exclusive tracks were done late last summer, and reflects the mood of what I was going through at that point in time," states Kartel. "Detained in jail without just cause, relationships between my baby mothers and myself--each with a different outcome, the death of a good friend...real life situations. I think my fans will love to get personal with Kartel, so this is their chance." Since his initial introduction as deejay (emcee) in 2002, Kartel quickly established himself as one of the most domineering talents in Dancehall. That same year, he was crowned Deejay of the Year at the Stone Love 30th Anniversary celebration. In 2003, he nearly topped the Billboard Reggae charts for the most singles sold, coming in second to Elephant Man. Crossover singles like "Tekk," "Gun Session," and "Ramping Shop" have earned Kartel international recognition, in addition to collaborations and remixes with Hip Hop and R&B stalwarts like Jay-Z, Rihanna, Missy Elliot, M.I.A, Pharrell, Kardinal Offishal, Akon, and Jim Jones. In recent years, he has been nominated for Source, VIBE, and MOBO awards. In 2009, Kartel has had six number one singles in Jamaica: "Last Man Standing;" "Million By A Morning;" "Ramping Shop" featuring Spice; "Mama;" "Dollar Sign;" and "Completely" featuring Indu. In addition, he scored two international hits with "Ramping Shop" debuting on the Billboard Top 100 Singles charts, and "Dollar Sign" being in regular rotation on popular urban stations in the U.S. This year he was also recognized by the EmE (Excellence in Music and Entertainment) Awards for Song of the Year, Lyricist/Songwriter of the Year, and Male Deejay of the Year. Pon Di Gaza is slated for release by Adidjaheim Records/NotNice Records on iTunes on Tuesday, September 22nd. The album's production credits include Ainsley "NotNice" Morris, Lenburgh "Leng" McDonald, Jordan McClure, and Tarik "Russian" Johnston.